Frost has killed about everything but kale and calendula in my garden. The roses and some herbs are able to survive in the unheated greenhouse, but soon the roses will have to go into the shop and remain dormant until late April and the herbs will die. The fresh herbs will be sorely missed, but I’ve found a way to enjoy them all winter. Drying them is a good option, but so much of the flavor is lost. 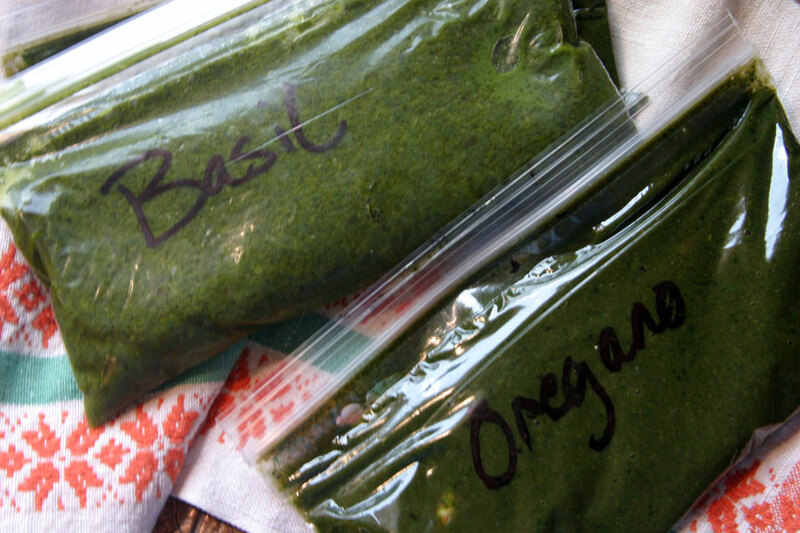 Give this a try to see how much more flavor you get from your herbs. 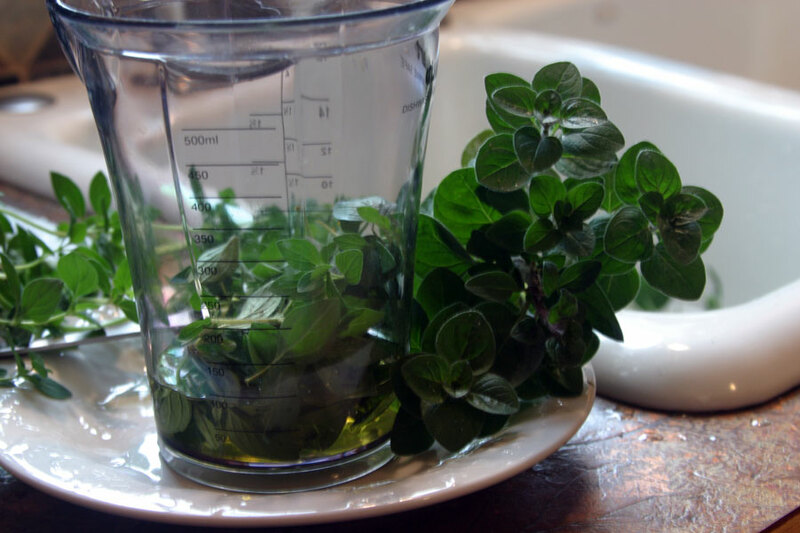 Gather herbs and place leaves, without stems, in a food processor, blender, or tall jar for using a stick blender. I used a stick blender. Add about a half cup of olive oil for a quart of loose herbs. Gather your herbs, whether a single variety or a blend and check for bugs. If they have bugs, soak them in lukewarm salt water for about five minutes and rinse and dry gently between layers of towel. Remove the leaves and place in either a blender, food processor, or a tall, narrow jar to use a stick blender. Add olive oil-enough to make a thick liquid when it is all blended. I add a little fresh lemon juice to keep the color bright, but you don’t have to. It is better to use too much oil than not enough. You will have a beautiful, pungent, green, thick liquid. I pour about a third of a cup into a snack size zip-lock bag. Label it and freeze it flat. When you want to use it, just open up the bag and break off a piece. 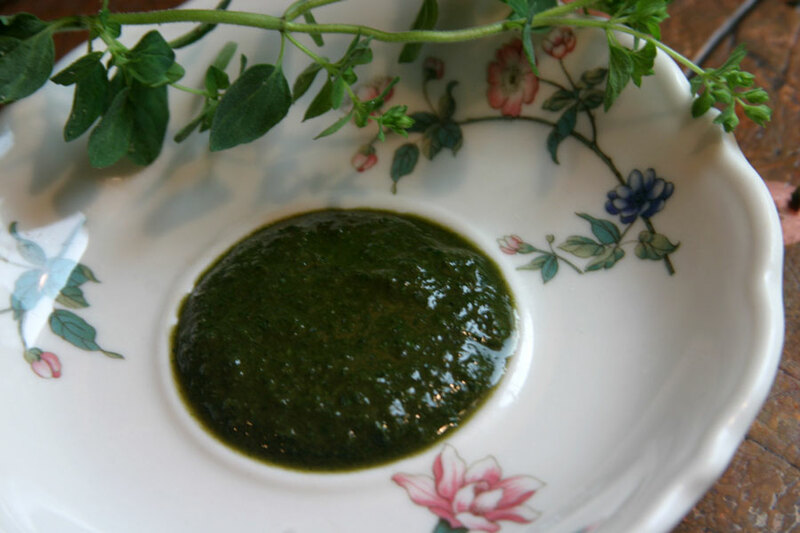 Stir it into soup, casseroles, pasta, salad dressing…you name it! Enjoy the fragrance and flavor, especially when it is dark and cold this winter. Freeze the bags so they lie flat and thin.